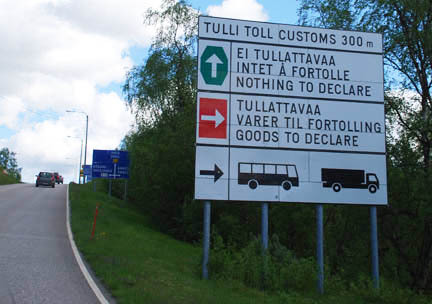 Our entrance back into the EU was as troublesome as when we left it when we entered Norway. We took the left lane with nothing to declare. We are in Finland at the very top of the country. We have enjoyed Norway, the fjords and water, the tundra and forests but not the expensive beer (the equivalent of $14 for one pint of local draft in a pub) and expensive campgrounds. Finland is a little cheaper but still more expensive than Western Europe. Our first night in Finland is at a very nice campground on a lake just on the south edge of the town of Inari. 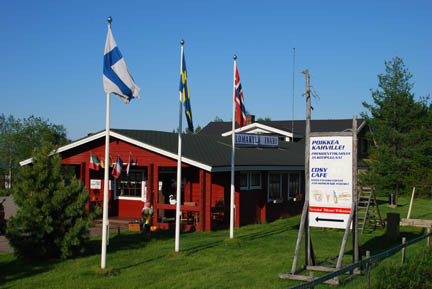 The Lomakylä Inari Oy Campground is owned by a couple of GoldWingers! They are members of the GoldWing Club of Finland and have a beautiful blue 1800. They have cabins, tent area and a section for RV's as well as a cafe and TV. It is a nice, well-run campground and I highly recommend it. Contact Tapani Lappalain at +358 (0)400-295-731 if you want to reserve. The day we arrived here was the first day we had seen the sun go around in a complete circle. Before this day we had clouds or high hills around us. That morning as we left our cabin in Nordkapp at 9 AM we could see the sun low in the eastern sky, at noon it was midway up the southern sky, that evening as we camped it was low in the western sky, at midnight (after Germany lost a rough finals in the Eurocup football match) it was just above the trees to the north across the lake, when bladder pressure got me up in the wee hours of the morning it was in the northeastern sky and finally when we left the campground about 9AM it was back to low in the eastern sky. We had watched the sun go around in a circle without ever dropping below the horizon. 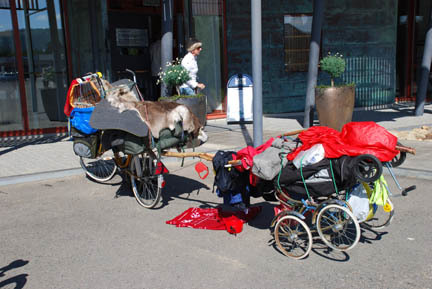 From there we headed to Rovaniemi where Santa Claus lives between his annual trips around the world. He has received 12.5 million letters from 197 different countries. He got 700,000 letters last year alone. 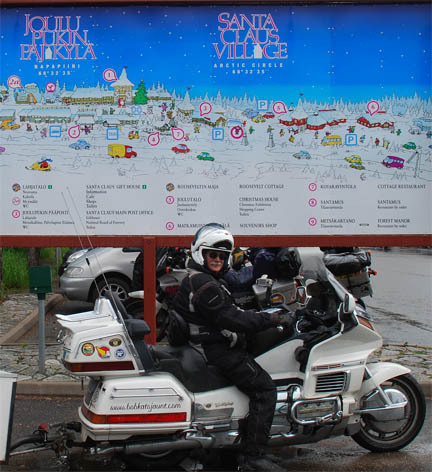 The UK, Italy, Poland and Finland are the top four countries that write to him in Santa Claus Village. This is where we again crossed the Arctic Circle. It runs right through Santa's office! In Rovaniemi is the Arktikum Museum, a very fine museum about the Arctic region of our planet, with emphasis on the Scandinavian Arctic. No pictures were allowed of the many realistic, life-sized dioramas. Also in Rovaniemi was a Forestry Museum with original logging camp buildings, displays and equipment. We also made a run into the back country and toured an amethyst mine. 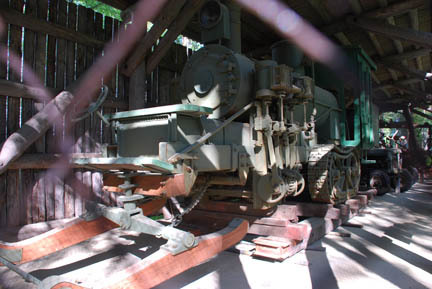 The mine opened in 1985 and is now open for tours. 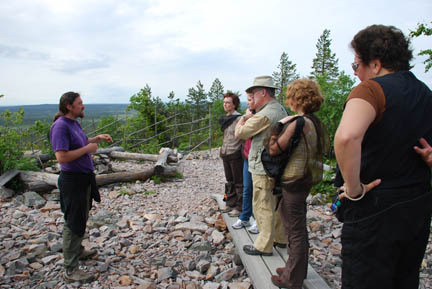 We took the tour with a guide from France and a Canadian family from Prince Edward Island. The Canadian women have gauze jackets on that is designed to repel mosquitoes which are fierce and numerous in Finland. The jackets even have a hood and face cover that can be zipped up. The mine was a 2.5 km. (about 1.5 m.) walk from the parking area. We arrived just as the next tour was starting and the guide gave an interesting talk on the history of amethyst and the area. It seems the value of the amethyst has dropped drastically and they do very little commercial mining of the site. What they do is charge you 13 Euros for the tour and let you dig for 15 minutes after the tour. You are allowed to keep your choice of the amethysts you find, as long as it fits inside your closed fist. That's it, one small rock for your 13€ and you dig it yourself! But it was fun. 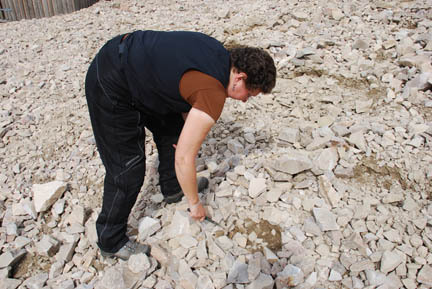 None of us found anything more than small semiprecious ones. At this Sami museum (the Sami are the indigenous people of the Scandinavian Arctic.) the bicycle in front was more interesting than the museum. It has a baby stroller as a trailer with a limb from a tree as the tow bar. There are lots of pads and mats covered by a reindeer hide as a seat. And there is a birdcage mounted in front of the handlebars to carry his small dog! He has more stuff than we do! After three days of blue skies and white fluffy clouds we have been caught in a drenching thunderstorm and set up a wet camp near Sonkjårvi to watch the "World Wife Carry Championships". The contestants have to carry a wife across an obstacle course. According to the rules: "The wife can be your own, you neighbor's, or you may have found her farther afield.". Sounds like fun!